Happy 200th birthday, Abe — honestly! Today is Abraham Lincoln’s 200th birthday, and as you might have noticed, he’s been getting a lot of press lately. Books, books, books about him. Revisionist theories, counter-revisionist theories, bunkings and debunkings and outright frivolities such as Christopher Buckley’s spoof of Lincolnmania at The Daily Beast. We don’t mind. We like Abe. (I know, I know: We’re supposed to like Ike. He’s looking better these days, too.) 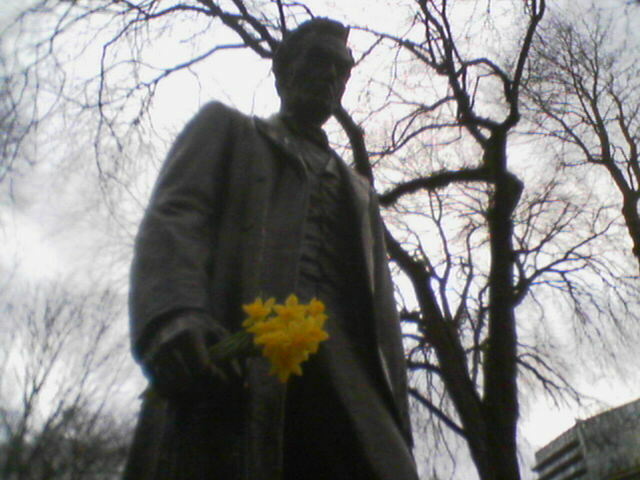 And we especially like the little private celebration that occurs every year on this date at the Lincoln statue in downtown Portland’s South Park Blocks, near the Portland Art Museum. That’s where Friend of Scatter Laura Grimes discovered this bouquet of thanks this afternoon and quickly commemorated it with her cell phone, a year to the day after one of our very first posts, also on the subject of Ms. Grimes’ encounter with this selfsame statue. Thanks, Laura. And happy birthday, Abe. Thanks for the guidance. We’re still trying to get it right.